Aww, nice... wasnt quite sure to start with, but that pred is looking better the more you work at it. If it's not too late, I like the checkers sweeping backwards better. But if you are still working on them, maybe you could have the pivot point on the top and bottom of the turret, that way they seem more uniform, and just draw closer together as the checks go around the curve. My current Projects Blog-Sculpting and Steampunk Stuff! Do you mean so they form a more triangular or trapezium shape instead of turning into diamonds? Though my guards may sleep and my ships may lay at anchor, our foes know full well that big guns never tire. Yes, and just to make the point clear, I scketched it up quick. But if you don't want to re-do both turrets, I would go with the first option. Sorry if I made more work for you. I mean, if you do it this way, you have to go back and change all the shoulder pads! YOU HAVE TO! Nah, the shoulder pads look right as they are! Any chance there will be an update soon? I've made progress on the predator, but not enough to post. I've also done some work converting some Catachan melta-gunners into Orlock/Tyrant's Legion flamer guys for my Tyrant's Legion part of my secessionist forces. They already had the end of the melta-guns chopped off, and I have no use for Catachans anyway. I just hate to wastemodels. They now have the towel hanging down fro their waste, armbands, bandanas turned into Orlock-style headgear, flamers and flamer-tanks, and belt-knifes turned into holsters. They are not quite done yet, but I'll post pics soon. I've Dettol-stripped a bunch of old second-hand metal Death Company marines and will paint them soon. However, I am a teacher, and Christmas holidays start next Thursday, so I'll get some conversion work done Thursday and Friday, then take some stuff to paint when I go visit my parents. I should hopefully get quite a lot done in the next few weeks. I'll also try to finish up a lot of the stuff that is at 80-90% done, so that I can hopefully field a 1000-point painted force soon. Teaching: it is a good profession for the hobbyist. Also, I completely understand the partial painting crisis. Theophony"... and there's strippers in terminator armor and lovecraftian shenanigans afoot." Solar_Lion: "Man this sums up your blog nicely." Anpu-adom: "being Geek is about Love. Some love broadly. Some love deeply. And then there are people like Graven. Bit of a tangent, but here is some stuff I wanted to show. It is terrain for use with my boards. These are prototypes. I have eight more ready to finish. I was originally going with the rectangular window deisgn, but it was way fiddlier than you'd expect. I actually think I prefer the circular window design that I switched to, but I wanted to get some other opinions before I finalise things. I've shown one of the WIP pieces so you can see how it was made. 1. Rectangular or square windows? 3. How much damage and/or weathering should they have? 4. Do you think they are any good? I say square windows. It makes it look less like a giant barrel. It also better to shoot out of. "The strong are strongest alone", Lufgt Huron, Tyrant of Badab. The Blood Reaver. Master of the Red Corsairs. Lord of the Maelstrom. 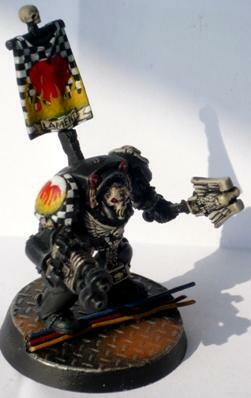 Huron Blackheart. Square door to, at least on the bottom edge. Man wasn't made for round doors. Really? Doors too? It is at least three or four times harder to make. Plus I have the round doors (airlocks?) prepared already. Hmmm... perhaps if you used a smaller tube (it can be very short... only a base width) and then put the round door on the end of that so it *looked* like an airlock? Sorry, the need to get these done and the fact that round is so ridiculously easier than square meant that I have finished them all as the round version. Just got to put on the touchpads and an undercoat, then I'll be putting these aside and trying to get back to painting minis. Great plog. I loved the old Badab war fluff back in Rt and I was excited to see FW modernize it. Great looking army so far. I personally like the round air-lock doors. I know whats it like to not have a lot of hobby time and having to make due with easier to make parts. 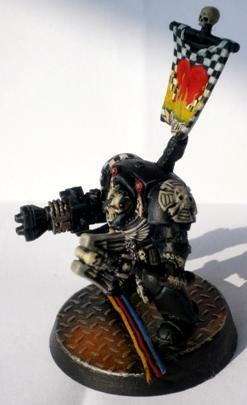 Can't wait to see some more paints, and also can't wait to see the Executioners. Please PLEASE keep them in the cammo armour. I always loved that and love seeing peoples different takes on it. CATS- How are you gentlemen? CATS- All your base are belong to us. CATS- You are on the way to destruction. CATS- You have no chance to survive make your time. Next up will be finishing the pred, then the scouts. I then need to get to 1000 points, so not sure what I will do after that. Probably assault marines. Maybe terminators. Lovely rich yellow there. I'm with you 100% on the use of transfers, hate the bloody things. I rely on micron pens, they're a godsend. And great to have you back! 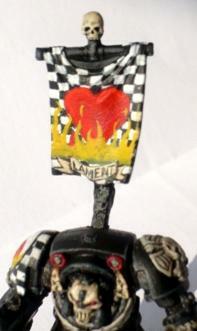 Nice work on those Lamenters there Fifty. Cheers. I think the yellow looks better in photos than in real life, unfortunately. Happier with the predator's colour, which looks worse in photos. I don't even like micron pens! I know it sounds ridiculous, but I'd rather do a bad job with a brush than a good one with a pen. I figure it is a good way of developing my precision and hand-steadiness to do something like writing. Cheers. Only taken three years to get that squad done. Little bit of progress on the predator. It looks a lot better in real life. This is closer to how I will be painting the rest of the yellow. Nicely done... makes me want to dig out one of my old Preds for a re-paint. I absolutely adore this model. I have 3 more regular preds in this pattern. They will probably be regular preds in my Astral Claws part of my secessionist army, but I almost don't want to paint them blue and silver - it seems almost wasteful to use metallics on them. Here are some final work in progress shots, but not ready for voting on. The base for the crux terminatus is half graveyard earth, half astronomican grey, then washed with soft tone, then gradually lightened. Bone is graveyard earth moving up to screaming skull. 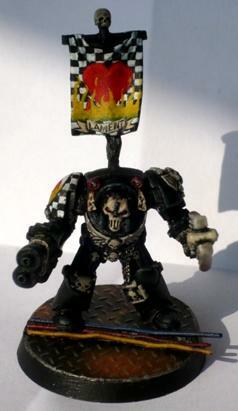 That terminator looks fantastic Fifty... banner and shoulder pad are real marks of a quality paint job.